For many doctors and patients, arthroscopic repair is the treatment of choice for meniscal tears. Indeed in many cases, this is warranted. This article will discuss bucket handle tear surgery, realistic recovery expectations following an arthroscopic bucket handle procedure, and various non-surgical options. You go to the orthopedist. You have a bucket handle meniscus tear. A look at an MRI convinces the doctor to offer a recommendation to have suture repair surgery (the doctor will stitch up the tear) as opposed to meniscus tissue removal surgery. The doctor tells you that based on the research, the results from this type of procedure are satisfying. How satisfying? Let’s ask the surgeons. A total of 38 patients (14 women, 24 men) with bucket handle tears underwent surgical meniscus repair. There were 27 isolated repairs and 11 that occurred within the context of an anterior cruciate ligament (ACL) reconstruction. Who is at risk for re-rupture and need for a second surgery? CONCLUSION: “Clinical outcome after meniscus bucket handle suture is satisfying. Re-rupture rate among this collective was 34.2%.” That is a quote. How about a second opinion on this? Doctors at the Department of Orthopaedic Surgery, Division of Sports Medicine , New York University Langone Medical Center, Hospital for Joint Diseases in New York released a May 2017 study (2) in which they investigated the failure rate for surgically repaired bucket-handle meniscus tears and compared the numbers in those clinical outcomes of bucket handle meniscus repair failure versus those that did not fail at a minimum 2-year follow-up. Of the 51 patients that had a bucket-handle meniscal repair, 12 (23.5%) were defined as failures (return of symptoms alongside re-tear in the same zone of the repaired meniscus within two years of surgery). The researchers found a higher failure rate (23.5%) for bucket-handle meniscus repairs at two-year follow up that has been cited in the literature, which is typically less than 20%. This is the first study to report these outcome scores solely for bucket-handle meniscus repairs, shedding light on the postoperative quality of life of patients with repair success or failure. MRI of the right knee without contrast. Noted are changes in the medial meniscus. See how even the radiologist cannot determine whether this represents a recurrent meniscal tear or is just post-surgical changes. How about a third opinion on this? Is bucket handle meniscus tear surgery necessary for every patient? The curious case of a 71-year-old patient that shows spontaneous healing is possible. Younger patients should pay attention to the lessons of spontaneous healing. If you are a young athlete of a parent of a young athlete, pay close attention to this case of a 71 year old man. It may save you from a surgery where one in three and one in four surgical failures are deemed acceptable. Doctors at the Department of Orthopaedics and Rehabilitation, University of Miami Miller School of Medicine describe the case of a 71-year-old-patient with a bucket handle meniscus tear that healed spontaneously. So something curious is happening here, something that can affect not only elderly patients by bucket handle injury patients as well. This case history involves a 71-year-old man with acute, displaced, MRI-confirmed right medial meniscus bucket-handle tear with mild effusion and no signs of degenerative joint disease. On physical examination, the patient was unable to fully extend the right leg due to locking of the knee. 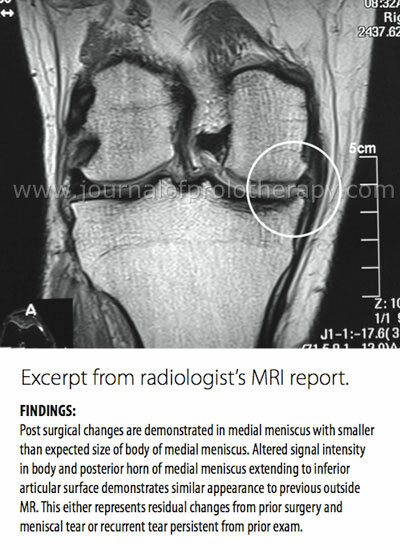 At 2-month follow-up, MRI showed mild degenerative changes and an anatomically reduced tear. At 6-month follow-up, the patient reported normal, pain-free knee function, and MRI showed the tear healing. He returned to his pain-free baseline level of physical activity. This case suggests that in elderly patients with displaced medial meniscus bucket-handle tears that reduce spontaneously, the physician can safely and efficaciously use conservative, nonoperative management to achieve restoration of baseline knee function and anatomic meniscal healing while avoiding the risks of arthroscopic surgery. We know what the athletes out there are saying – that took 6 months! Yes, but 6 months is less time than 1/3rd of you having to go through a second meniscus surgery. However, there can be a way to speed up and help this spontaneous healing. “An 11-year-old male patient complained of painful swelling and locking due to a displaced bucket-handle tear of the lateral meniscus. We recommended an arthroscopic surgery; however, the patient left the hospital without surgical treatment. Six weeks afterwards, he returned without any complain of pain and he regained full range of motion. Do these times of spontaneously bucket handle meniscus tears happen all the time? Both of the above reported cases are considered “rare.” But is spontaneous healing of a bucket handle meniscus tear without surgery that rare? At our clinics we are also very interested in spontaneous healing. All healing is spontaneous. As soon as you suffer a bucket handle meniscus tear your body is trying to heal it. Unfortunately, your body is usually not that successful at it and that is why you were off to a surgical consult. In our clinics, one of the treatments we offer to help accelerate and augment non-surgical repair of meniscus injury is Platelet Rich Plasma Therapy combined with Prolotherapy. In the video below a general description and demonstration of the treatment is offered. Writing in the Physical Medicine and Rehabilitation the journal of injury, function, and rehabilitation, (6) Jessica Urzen of the University of Louisville and Brad Fullerton of the Texas A&M’s College of Medicine, reported of a case of a patient with a bucket handle meniscus tear that resolved non-surgically with Platelet Rich Plasma injections. At this point, we are going to ask you to do one of two things. Continue on with your research at our companion articles on PRP and Prolotherapy for meniscus tears where we will explore research on Platelet Rich Plasma therapy for meniscus injury. This is an especially good article is for people exploring the possibility of meniscus arthroscopic surgery, meniscus arthroscopic surgery with PRP augmentation, or PRP injections for meniscus tears as an option. See Platelet rich plasma injections for meniscus tears. Or if you would like to explore these treatments, ask us your questions.